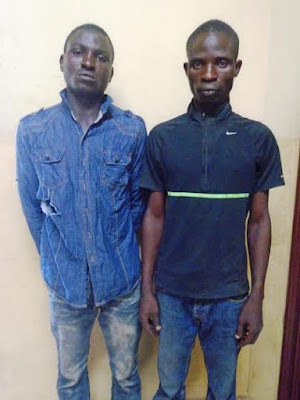 24 years old Taoreed Ashimiyu (left) who was recently arrested by the Lagos state police Rapid Response Squad for pick pocketing, says he has spent all his proceeds from pickpocketing on both old and young prostitutes. Taoreed and his accomplice, 34 years old Kayode Jolaade were arrested for stealing of peoples phones at different BRT buses in Maryland and Mile 12 areas of the state. Taoreed, who hails from Yemetu, Alawada in Oyo state, said that he spent the proceeds from stealing on prostitutes. “I have not spent a dime from my proceeds in stealing on anything tangible. I womanise a lot and I spent my monies on both young and old ladies. I smoked indian-hemp and drink all sort of hard drinks. My accomplice caused my arrest today.